I undertook this experiment to see what level of fidelity a Portastudio was capable of, if used by someone with a bit of knowledge about tracking, which I definitely wasn’t when I was using a four-track recorder regularly between 2000 and 2006 (strange to think I’ve been recording digitally longer than my analogue period lasted). 1) Modern records do not, speaking generally, sound very good to my ears. 2) The problems I hear are not necessarily related to the fact that the songs were recorded to hard disk rather than tape. They have more to do with persistent and unmusical use of tools such as compression, EQ, pitch correction and quantisation in a manner that would be close to impossible in the analogue domain. 3) Continued use of 16 bit/44.1 as the digital standard in this day and age strikes me as daft. Ditto MP3s. As hard drives get bigger and bigger, lossless files could easily replace MP3s (they could have done already). The sticking point seems to be the replacement for many people of the dedicated MP3 player with multi-purpose smartphones, with smaller hard drives and more kinds of media content competing for the limited space. I don’t know the size of the hard drive in my Samsung Galaxy, but it sure ain’t the 120GB in my iPod Classic (a form of iPod that Apple now seems to consider entirely obsolete, damn them), which allows me to carry around a significant percentage of music in WAV format. 4) Most of my favourite records sonically were recorded to tape. But not all. I can think of many digitally recorded albums/songs I think sound very good, some of them going back to the Soundstream days (my beloved Tusk). 5) I recognise the flaws digital has as a long-term data-storage solution (the main point Steve Albini makes against digital nowadays – it’s a point well made). 6) My attraction to lo-fi when I was younger had (I now think) a definite self-conscious, purist aspect to it, but also grew genuinely out of a conviction that simple presentations allow the song to shine through. So to specifics, then. Funnily enough, the thing I’m least satisfied with about the four-track version of Find Out In Time is the 12-string acoustic sound. The drums do their job well enough. The snare drum doesn’t have the focused crack I look for at the front of the stroke, but that’s probably to be expected since there was no close snare mic. The floor tom gets lost a little bit but it’s only hit during one fill – the placement of the kit mic at the front and middle of the drum set, pointing at the snare, was always one that would lead to compromises. I made the choices I thought best given the part I intended to play. Overall the drums sound decent enough. The bass (Fender Jazz through Laney amp), is OK, although boy would I have liked a little bit of compression on the track. The vocal’s mixed too low, as is my habit when mixing my own songs, but it sounds OK – listened to in solo, everything’s audible and the vocal sits way above the noise floor without getting into crunchy territory (accomplished by recording the verses first, then resetting the gain levels and doing the choruses separately). But the guitar? It sounds kind of warbly and has an unpleasant hardness to it in the upper mids that really doesn’t sound like my guitar sounds normally do. The mic, the instrument, the room and the player were the same as I would normally use – the only different element was the Portastudio. I’m not saying that those unpleasant qualities are definitely from the four-track, and if they are, with practice I’m sure I could develop techniques to get around them and find a way to get something closer to ‘my’ acoustic sound, but of all the elements on this recording, the acoustic guitar is definitely my least favourite. Of course, tastes vary. Some people might hear this and prefer it to the digital version I made last year. While that version’s sure not as good as it could have been (I recorded it in D after trying and failing to hit the harmonies satisfactorily in E. In retrospect, I wish I’d stayed in E and either persevered with the high harmonies or found someone else to sing them), it better captures what I want the song to be than the four-track version does. I don’t know whether I was expecting to find the Portastudio capable of greater or lower fidelity than I encountered during this experiment. 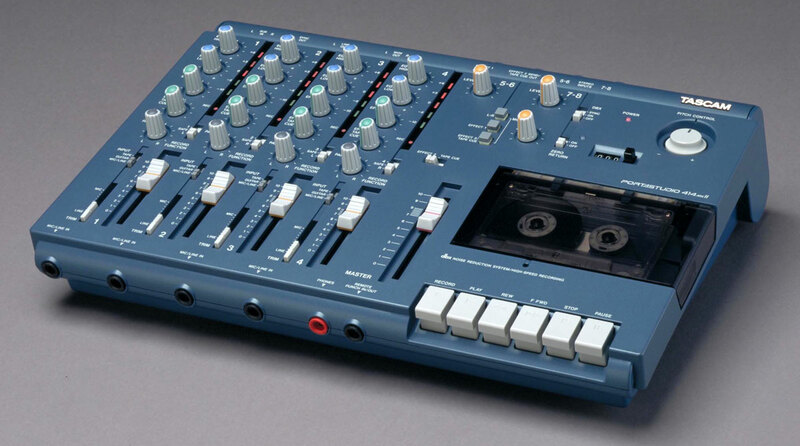 I think it unlikely, though, that I’ll be recording much on analogue tape again until such time as I can work on some real-deal gear. 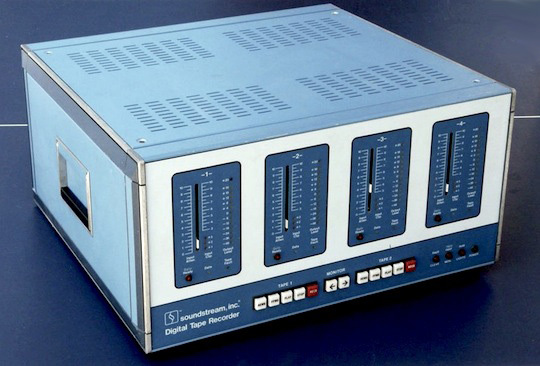 This is the Soundstream digital recorder, invented by Thomas Stockham in, would you believe, the late seventies. Stockham also played a crucial role in bringing down Nixon. Good dude (Stockham, that is. Not Nixon). This entry was posted in Gear, General, Music and tagged 12-string guitars, Find out in time, hi-fi, home recording, lo-fi, mid-fi, portastudio, Ross Palmer, Sound recording and reproduction, Soundstream, Tascam, the evil that men do, the lowest of fi on July 29, 2013 by rossjpalmer.